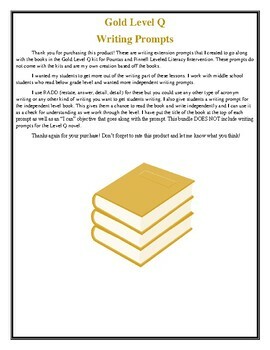 This product includes writing prompts for every book in the Gold Level Q kit for Fountas and Pinnell LLI. These are original writing prompts I created to go with each book. All instructional and independent books have a prompt. These can be used for any grade level but are geared a little more towards older students who just read below grade level. 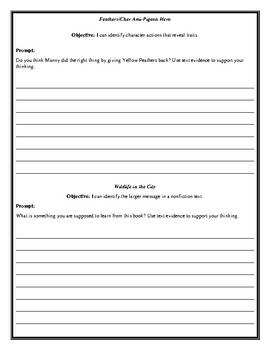 This product includes "I can" objectives to go along with each book and lines for students to write their answers on. I cut these in half and pass out to students to write on. 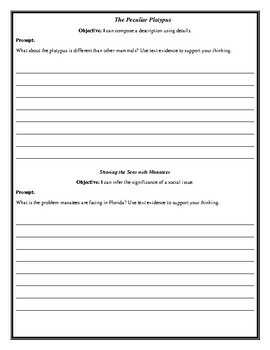 This makes it easier to review, grade, etc. than lugging home their LLI writing notebooks. Or you could print and paste into their writing notebooks. This product DOES NOT include prompts for the Gold Level Q novel. That is a different product.